It's a dilemma extremely familiar to anyone with social anxiety – for how long to make eye contact before looking away? The fear is that if you only ever fix the other person's gaze for very brief spells then you'll look shifty. If you lock on for too long, on the other hand, then there's the risk of seeming creepy. Thankfully a team of British researchers has now conducted the most comprehensive study of what people generally regard as a comfortable length of eye contact. The participants' main task was to sit close to a monitor and watch a series of video clips of the same actor or actress making eye contact with them for various durations between 100ms (a tenth of a second) and 10,300ms (just over ten seconds). The particpiants' pupil dilation was recorded while they watched the brief clips, and after each clip they had to say whether the length of eye contact felt too long or too short for comfort. Each participant watched 40 clips of the same actor or actress, but there were 8 actors and actresses used in the study, all of them Caucasian. The participants also filled out a personality questionnaire and they rated the actor or actress who'd appeared in their clips for various characteristics including attractiveness and threat. Surprisingly, there were no links between the participants' personality profiles and their preferences for length of eye contact. There were also no major effects of participant age or gender – the only exception being that among male participants looking at clips featuring an actress, the older the man, the more likely he was to prefer longer eye contact. In terms of the participant ratings of the actor or actress, only threat was relevant, with participants who rated their actor or actress as more threatening tending to prefer shorter eye contact durations. The researchers were interested in the participants' pupil dilation because it's a marker of physiological arousal. 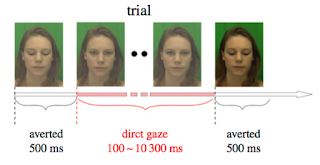 They found that participants who showed greater pupil dilation in response to the video clips tended to prefer longer eye contact. The meaning of this finding is unclear – negative emotions usually elicit more arousal, so we might have expected the opposite result. 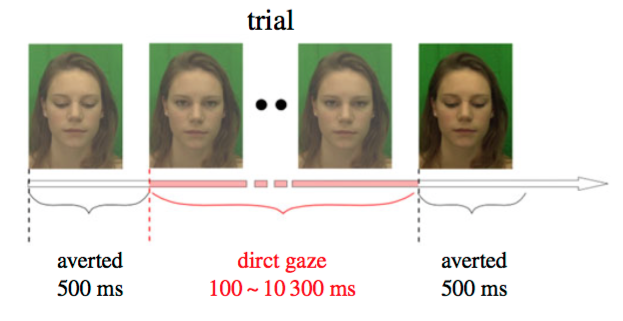 The researchers speculated that the greater physiological arousal in this context might be traceable to a rapid, automatic form of face processing that takes place in subcortical areas of the brain, and that "activity within this early eye contact processing stage is enhanced in participants who favour longer periods of direct gaze and who presumably feel more comfortable in engaging in a communicative link."